Walpurgis on 30 April is a widely celebrated event in northern Europe and Scandinavia, most of all in Sweden. It is a celebration of spring and marked by music, singing, and bonfires. Sweden celebrates Walpurgis night, or "Valborg" or "Valborgsmässoafton"
An evening celebration in which includes the singing of traditional spring folk songs and the lighting of bonfires. Germany celebrates Walpurgis Night, or "Walpurgisnacht", or "Hexennacht" – "witches' night"
According to German folk tales, this is the night when witches fly to Mount Brocken in the East of Germany to hold a celebration and await the beginning of spring. 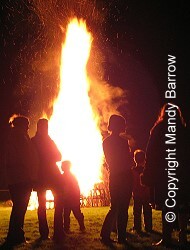 The night is marked by dressing in costumes similar to Halloween and by singing and dancing around bonfires. Finland celebrations of "Vappu" (or May Day) begin officially on 30 April, which is known as "Vappuaatto". The celebration is marked by wearing of hats and a carnival atmosphere. In Finland May Day Fritters (called tippaleipä in Finnish) and Mead (called sima in Finnish), are traditionally served and enjoyed.